Goulash is a traditional Hungarian stew of meat, seasoned heavily with paprika. I love making traditional dishes from countries around the world, and was excited to try this comforting classic. When it comes to making soups and stews, most recipes make a massive quantity. I was excited to see a recipe for Hungarian Beef Goulash with Dumplings in One Pan, Two Plates, a cookbook filled with recipes serving 2 people, and only using a single pan. I thought this would be a unique method for making goulash that was perfect for just myself with one leftover meal for another night. This was super easy to make, and yet developed a lot of flavor in a short amount of time. The dumplings are a really nice addition, although not necessarily part of the classic presentation. I will say that my potatoes didn't cook too evenly once I added the dumplings to steam on top, because I wasn't able to mix the goulash at that point, but after the dumplings finished I gently removed them and then seasoned and cooked the goulash another few minutes to make sure everything was cooked evenly. I loved how hearty and satisfying this goulash is! The sour cream garnish really balances everything out, and adds a nice cooling element to the finish. Heat a 12-in/30.5-cm skillet over medium-high heat and add the olive oil. When the oil shimmers, add the bacon and cook, stirring, until it has given off its fat but isn’t crispy yet, about 2 minutes. Add the beef and 1/2 tsp salt and spread the beef cubes out in an even layer in the pan. Let the meat brown on one side without moving it, about 3 minutes. Turn the meat with tongs or a fork to brown on a second side, another 2 minutes. Add the onion, bell pepper, garlic, paprika and tomato paste and continue to sauté until the vegetables begin to soften and the bottom of the pan gets nice and brown, about 4 minutes longer. Add the potatoes, beef broth, vinegar and a few grinds of pepper and scrape up all the browned bits from the bottom of the pan. Bring the mixture to a simmer. Meanwhile, in a bowl, whisk together the flour, baking powder, and 1/4 tsp salt. Combine the milk and butter in a cup and microwave on high for 10 seconds at a time until the butter is melted. Add the milk mixture to the flour mixture and stir just until combined. Drop the batter by tablespoonful into the simmering stew; you should have enough for about eight dumplings. Cover the skillet, reduce the heat to low, and simmer the stew until the vegetables and dumplings are tender, about 15 minutes. (Don’t peek! The steam will be released and your dumplings may not be as puffy and light as they could be.) To check for doneness, run a toothpick into a dumpling. It should come out with dry crumbs adhering to it, not wet and gooey. If it’s wet, cover and cook another 3 minutes and check again. Scoop the dumplings into warmed bowls. Taste the stew for seasoning, adding more salt or pepper if needed. Ladle the stew over the dumplings and top each portion with a dollop of the sour cream. Serve hot. I'll be sharing days 3 and 4 in Pittsburgh in a single post, as they are almost entirely food focused. Yum! We began our morning eating leftover Banana Nilla Pudding Pie from the night before. This was Lily's first taste of pie, and she loved it! We hung out for a while just relaxing before heading out for lunch at Primanti Brothers, a local chain restaurant and bar that is synonymous with the Steel City. Primanti Brothers is known for its substantially overstuffed sandwiches filled with meat, French fries, and vinegar-based coleslaw. The menu also features other bar favorites such as wings, tater tots, and more. A.J. and I decided to go halfsies on her favorite Primanti Brothers sandwich, the Rajun Cajun, as well as some of the 59 cent wings since we happened to be there on a Monday. The Rajun Cajun sandwich features chicken breast and cheese as the main filler, along with the standard French fries, vinegar-based coleslaw, and fresh tomato between slices of soft and squishy Italian bread. The sandwich wasn't nearly as messy as I expected, which was good. I liked that the coleslaw was vinegar-based because the sour flavor reminded me of sauerkraut and kind of tied in Germanic influences from Pennsylvania into the flavor profile. Overall though, I feel like it was over-hyped and overrated. The sandwich was satisfying for sure, but didn't really blow me away. I'm really glad I tried it since it's a local favorite, but I wouldn't feel the need to try it again. I actually preferred the wings over the sandwich we got, but alas I am a wing girl! We tried a couple flavors including the Honey Buffalo and Spicy Garlic. Both were excellent! The Spicy Garlic was definitely spicy, but very tasty. The Honey Buffalo was pretty mild, and I enjoyed the sweeter twist on a classic Buffalo wing. It was nice to have a flavor less potent than the Spicy Garlic to wash down the rest of our meal. After lunch we ran some errands together, and took a stroll around Walnut Street, a cute little shopping area in Shadyside, a residential neighborhood in Pittsburgh. Later that evening, A.J. and I headed downtown for dinner at one of her favorite spots in the city, Meat & Potatoes. They have an extensive menu including Build Your Own Meat & Potatoes for Two, but we decided to share a bunch of Snacks and Appetizers off the menu instead. Let's start with the Fried Brussels with Parmesan and lemon aioli. These were excellent! Super crispy, toasty, and cheesy, with a light and refreshing dipping sauce. A fantastic choice. Next we tried the Devils on Horseback, which are dates stuffed with chorizo and Manchego cheese, wrapped in bacon, and topped with a piquillo pepper sauce. These were probably our least favorite dish of the evening. They were ok, but nothing special. We also got the Poutine, which is a generous helping of fries topped with gravy, cheese curds, and scallions. I've never met a poutine I haven't liked, and this was a wonderfully satisfying addition to the story of my life. The Wild Mushroom Risotto here is a must! This is one of A.J. 's favorites from previous visits, and I concur that it's quite excellent. Creamy and cheesy with a hint of aromatic truffle. Last but not least, we also got the Cobb salad, which was split onto two plates for us to make it easier to eat. It features iceberg carpaccio (essentially a thinly sliced cross-section), bacon lardons, tomatoes, Maytag blue cheese, egg, and avocado ranch dressing. This was the "fresh" component to our meal, and was a lovely way to round out our super filling array of dishes. Let's not forget the delicious cocktail I tried. A.J. teased me because I didn't believe her that a Corpse Reviver #2 is an actual classic cocktail, then she proved me wrong with Google :) I couldn't resist the name and the description, so I ordered this classic cocktail of Tanqueray gin, Cointreau, Cocchi Americano, lemon, and Copper & Kings Absinthe. It was tastier than the name sounds, that's for sure! We took a little stroll toward the river after dinner to check out the view. Pittsburgh really is lovely at night, with all the bridges lit up! The next morning I taught A.J. how to make scones. She had the assumption that scones were difficult to make, so I set out to prove her wrong, and that I did! We used my basic scone recipe and added chopped dried pineapple, shredded coconut, and a dash of rum to make a pina colada inspired variation. They turned out great! This was my last day in Pittsburgh so before heading to the airport later that afternoon we had one final meal together at Noodlehead. We actually started with the Pork Belly Steamed Buns from the Snacks menu. This was a wonderful couple of bites to momentarily subdue our growling bellies. A.J. 's favorite noodle dish is the Street Noodle #1, a combination of rice noodles, Thai fried chicken, bok choy, bean sprouts, and cilantro. There is a large scale of spiciness here at Noodlehead, but let us assure you that even the #2 (medium) on the spicy scale is very comfortably spicy! I love spice, but can't see myself getting anything spicier than that while still enjoying my meal. I tried a couple bites of A.J. 's noodles, and really enjoyed the flavor! This is a solid choice. I decided to get the Chiang Mai Curry, which features egg noodles, chicken, pickled mustard greens, bean sprouts, and crispy shallots in a yellow curry coconut milk sauce. It's so saucy that it honestly makes me think it's borderline soup. I would have loved an Asian soup spoon to get more of the broth with each bite, but settled for a regular spoon and my chopsticks to pluck at the noodles. I really enjoyed our lunch at Noodlehead. My mouth was still tingling from that flavorful and spicy meal as we headed next door to cool things down with a scoop of ice cream at Millie's. A.J. opted for a kiddie scoop of the salted cookie ice cream, while I couldn't resist a refreshing scoop of peach sorbet. Everything here is fresh and homemade. This was the perfect sweet finish to my Pittsburgh adventure. Although I enjoy berries very much, stone fruits are my favorite fruits of the summer. I feel like plums don't get the respect they deserve. They are often overshadowed by fuzzy peaches, juicy nectarines, and even petite apricots, but plums rank pretty high on my list. 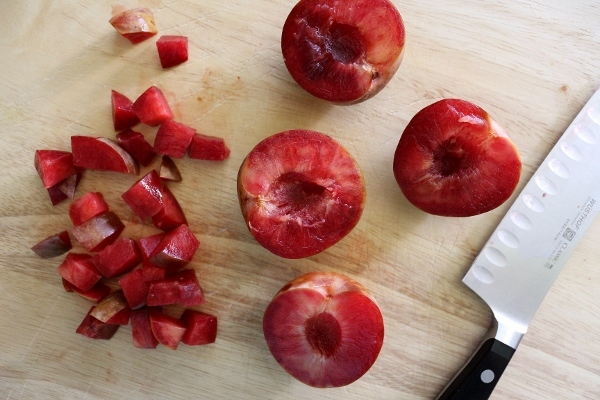 Plums come in many different varieties, and range in colors from their skin to their flesh. 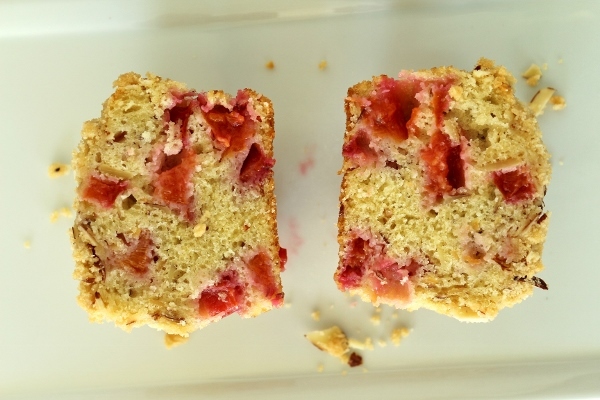 I recently had an abundance of juicy red-fleshed plums in my kitchen, and decided to use a few of them in this lovely muffin recipe. 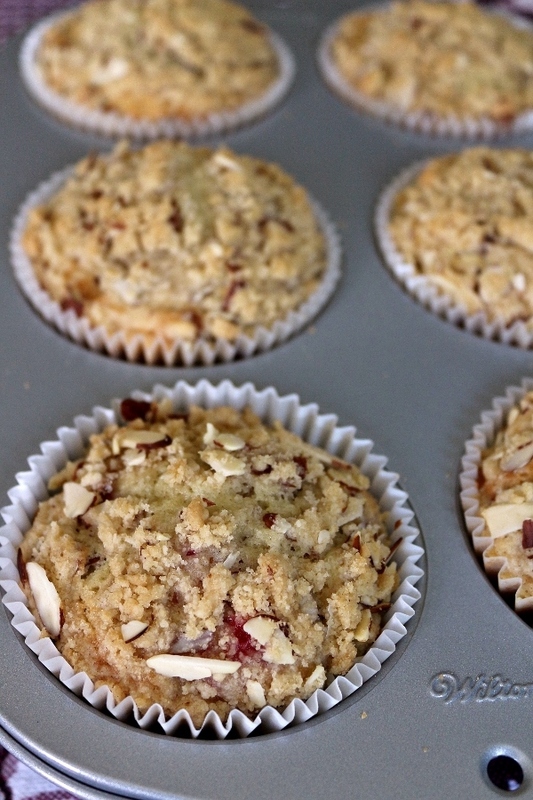 Muffins are incredibly simple to make, even for a hesitant baker. 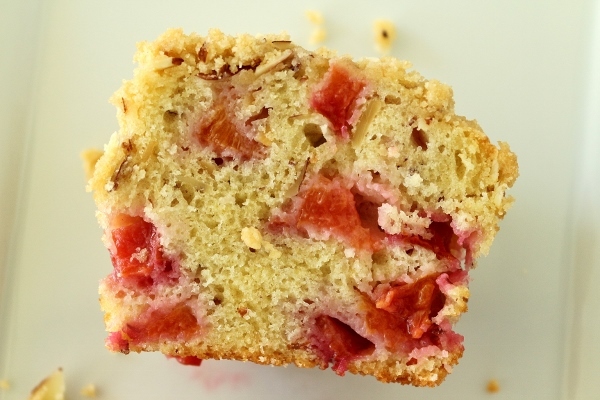 The key is to avoid over-mixing the batter, and voila: perfect muffins every time! 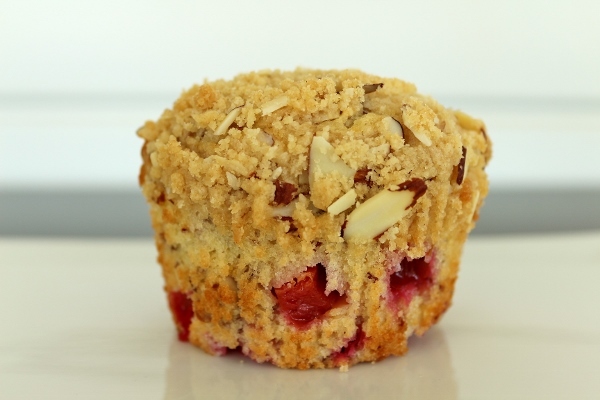 These particular muffins are studded with sweet ruby-red morsels of plum, and peppered with sliced almonds both within the batter and on top. I was using up the last of the sliced almonds in my pantry, so I didn't have enough for what the recipe suggests, so I scaled down and used what I had on hand. The muffins were still perfect, but I would imagine they would have a bit more texture if you use the full amount. 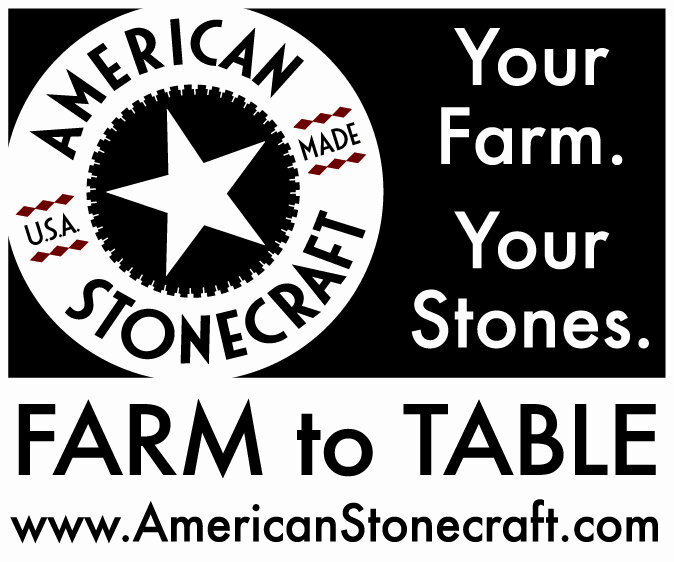 I love them exactly as they turned out, and have no regrets on scaling down the almonds. 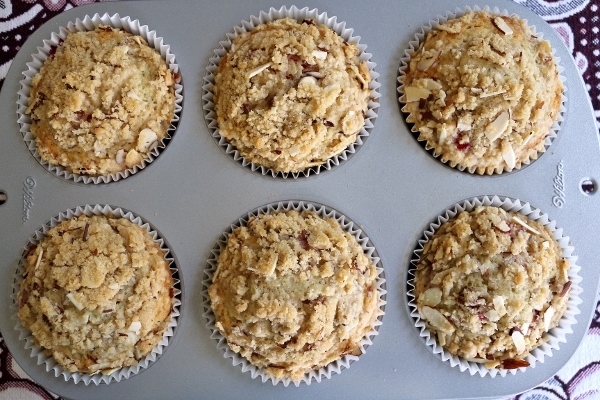 You can easily make standard size or jumbo muffins with this recipe. I usually make standard muffins, but decided to exercise my neglected jumbo muffin pan this time around. Preheat the oven to 350°F [180°C]. Line a 12-well standard or 6-well jumbo muffin pan with paper liners or coat thoroughly with nonstick cooking spray. To make the streusel: In the bowl of a food processor fitted with the metal blade, pulse the butter, flour, and brown sugar in 1-second intervals until the butter is cut into pea-size pieces. (Alternatively, combine the butter, flour, and brown sugar in a bowl and use two knives or rub between your fingers to break up the butter into pea-size pieces.) Stir in the raw sliced almonds. 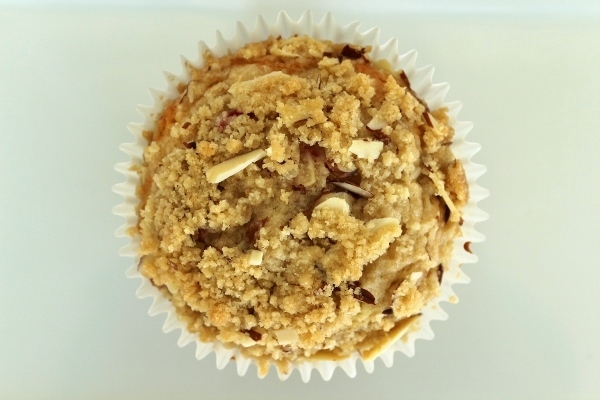 The streusel should be a mixture of crumbly and chunky. Set aside. To make the batter: In a large bowl, whisk together the melted butter and the eggs. Add the milk, almond extract, and vanilla and whisk until well combined. In a medium bowl, whisk together the flour, granulated sugar, baking powder, and salt. Stir in the toasted almonds. Add the flour mixture to the butter mixture and use a rubber spatula to carefully fold together until almost combined. Gently fold the plums into the batter. 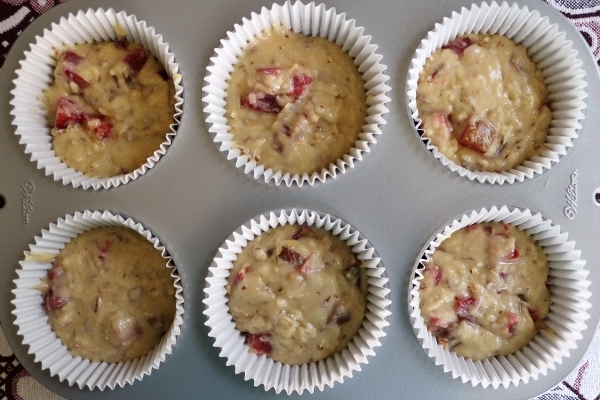 Be careful not to overmix, or your muffins will be tough; the batter should still have a couple of streaks of flour. 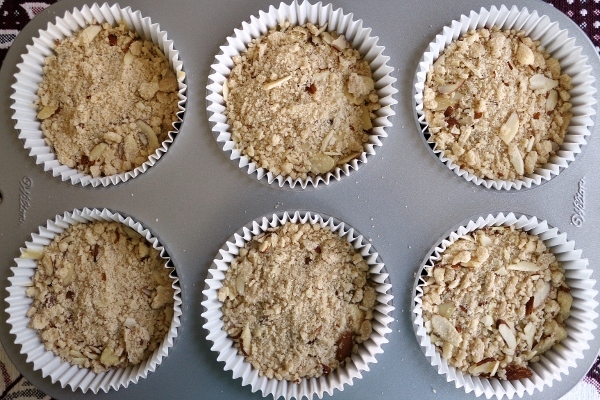 Divide the batter equally among the prepared muffin wells and mound each well with an equal amount of the streusel. Bake until the tops are golden brown and a muffin bounces back when you poke it gently in the center with a finger, 22 to 26 minutes for standard size or 30 to 35 minutes for jumbo. Remove the muffins from the oven and let cool in the pan for 5 to 10 minutes. Carefully lift the muffins from the pan and transfer them to a wire rack to cool a little more. (Use a butter knife to lift the muffins out if you didn’t use paper liners.) Serve warm. Previously we spent some time exploring Pittsburgh's Strip District, and today we'll be visiting another popular tourist attraction in the City of Bridges, but first we're having a simple and delicious homemade lunch prepared by my hostess A.J. : spinach and thyme pesto, fresh mozzarella, and heirloom tomatoes sprinkled with sriracha salt, and sandwiched between slices of olive oil bread. This gave us sustenance before heading out for our afternoon adventures. The Andy Warhol Museum was definitely one of the highlights of the trip! I feel like Andy Warhol's art can be an acquired taste for some, but I really enjoy his work and absolutely loved this museum in his hometown. The museum is set up chronologically through his life starting on the top floor and working down. It's amazing to see his earliest works, and how his art has developed throughout his career. There are some pretty cool interactive exhibits, like the Silver Clouds and also the screen test, although I would say the screen test felt a bit anticlimactic to me. It probably didn't help that I was being watched by tons of museum-goers for the full 3 minutes I sat there just staring forward at the camera. One of my favorite rooms in the museum was the room filled with paintings of skulls! That evening A.J. prepared a homemade dinner for us to enjoy after our quintessential Pittsburgh afternoon at the Andy Warhol Museum. She assembled these delicious Nikuman Japanese steamed buns by hand, and suggests at least doubling the filling for the amount of dough specified in the recipe. The dough was pillowy soft, and the filling juicy and flavorful. These were an excellent start to our evening meal. A.J. made the filling for these white fish escabeche tacos earlier in the day so they would have time to marinate. They are served cold, which is quite refreshing after a hot day in the city. I really enjoyed this simple yet flavorful make-ahead fish taco filling. As a taco connoisseur, I'll happily add this recipe to my arsenal of favorites! I had promised A.J. prior to my visit that I would bake her any pie she desired. I even made and froze the pie dough in advance, and brought it will me in my carry-on luggage to save time upon my arrival. The pie she selected was one of my personal favorites as well, this Banana Nilla Pudding Pie. We served it with a homemade cocktail that compliments it perfectly, and features spiced rum (A.J. made some from scratch using dark rum and spices), banana simple syrup (also homemade), and lime juice--we omitted the bitters. It was strong, but really good and reminded me of a classic banana daiquiri, shaken not frozen. What a great day in Pittsburgh, with a visit to a fun museum, relaxing times with friends, and delicious home-cooked food!